Sitka Gear continues to improve their gear offering, especially for mountain hunters and 2012 is no exception. June 1st sees the release of several new items in Sitka’s “Open Country” lineup. For those of you who don’t know “Open Country” camo is arguably the best mountain hunting camo available on the market today, and it’s not just for mountain hunting. 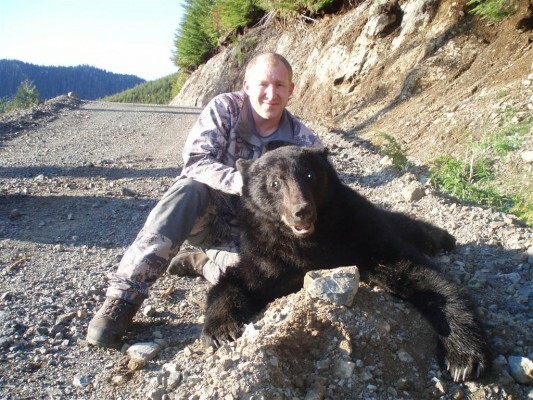 The Open Country camo has proven very versatile for hunting here in BC and is an excellent choice for anyone hunting the logged out slashes in search of deer, elk, moose and bear where you’ll blend right in with the mixture of dead tree limbs, brown rock, dirt, gravel and debris left over from logging. Open Country will help you get closer! The new “open country” lineup for Sitka Gear (in my own opinion) is a move to close in on two niche markets. #1. Backpackers and the light weight crowd (Dewpoint) and #2. Regular Guys – By offering quality Open Country rain gear at more affordable price points (Cloudburst) than some of their existing offerings. I might be totally off-base with that assessment, you decide! 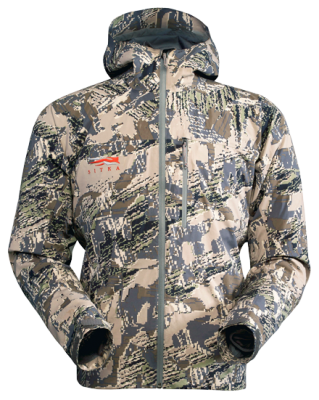 The Sitka Cloudburst Jacket is a new waterproof, breathable jacket in the open country pattern. If you’re not ready to go “all in” with the Stormfront or the Coldfront then the Cloudburst will be an attractive option for you and about $150 less (than the Stormfront). You’ll get wet weather protection in famed “open country” camo for a little less money. – 20 oz’s approx. weight. Obviously meant to work with the Cloudburst jacket the pants are also a new waterproof, breathable pant in the open country pattern. Actually a little bit lighter than the Stormfront pants, and also a little lighter on the wallet as they are about $100 cheaper. Not lacking in design features these will still be a great option for any mountain hunter looking to get concealment benefits of Open Country camo. I am excited about the Dewpoint gear because it’s targeted specifically for backpack hunters. Lightweight and packable, you can now get the concealement benefits of Open Country camo with the protection of a Gore-Tex outer layer. The Dewpoint is the lightest weight Rain Gear in the Sitka lineup for the guys who haul enough gear on long hunts where ounces matter! 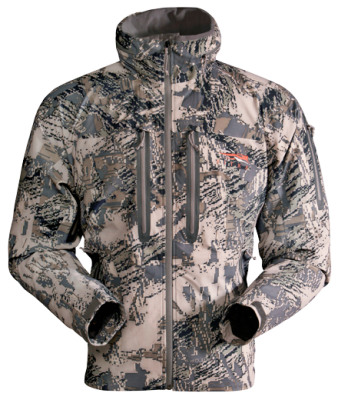 – Lightest weight Open Country waterproof layer. Again the Dewpoint pants are aimed at the backpack hunter and guys who are hauling their gear on long haul backpack hunts where every ounce matters. 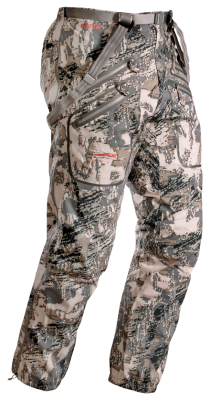 Lightweight and packable rain gear with the concealement benefits of Open Country camo make these pants an excellent choice for any backpacker looking to shave weight and gain function. – Lightest weight Open Country waterproof pants. For late season hunts desert country, it work pretty well. I tried it last year on an antelope hunt in central NM and things were still a bit green for it to work real well. It seems the antelope busted me (or at least go curious) more with the Open Country than with the greener camo I wore later in the afternoon. Just one experience though, and it seems to work real well in open areas with dried grass, especially if you lay prone in the dead grass and don’t back up against a green mesquite or creosote bush.